Have you ever experienced a situation where you do not feel like driving through the jam just to buy dinner after work? Don't you wish that once you get home, there's food ready for you on the table? Unfortunately not everybody have a home cooked meal ready for us when we come home from work or college. For me, I usually eat outside food for dinner, most of the time it is either I buy food from Bangsar, order Dominos, or other fast food. Sometimes I wish there were more food variety for home delivery, because driving through the jam just to get dinner can really be very tiring. Our food problems will soon be solved! Because foodpanda is now available in Malaysia! If you have not heard of foodpanda, it is basically a food ordering service that not only provides convenience for us customers, but at the same time they provide a great variety of culinary choices ONLINE. food online should be easy, fast and definitely fun! "At foodpanda, we believe ordering food online should be fuss-free, fast and definitely fun. Banish the pain of cooking and cleaning up! Enjoy a variety of cuisines at your home or office. With just a few simple clicks, foodpanda helps you to easily order food over the internet. Steaming hot food is conveniently delivered to your home or office." 1. Enter your area. Once you've entered your area, there will be a list of restaurants available for your area. *If your area is not available in the website, don't worry because foodpanda is new, so locations might be limited for now. But from time to time they will include more locations for this convenient, fun and awesome food service. 2. After choosing the restaurant of your choice, look at the menu. 3. After you're done choosing your food, click "ORDER NOW"
4. You will then be asked to fill in your details if you do not already have an account. 5. After filling your details, the website will guide you to the next few steps. 6. Payment will be via Cash on Delivery. *Here's a useful tip: Order your food before you leave your office! So by the time you get home, it'll be just nice for you to eat. Delivery time varies depending on restaurants. After completing the order process, the cute panda will be on its way to deliver the food to your doorstep! 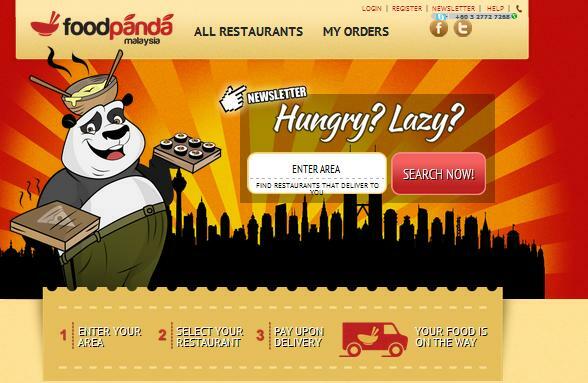 foodpanda's online delivery service first started of with 45 restaurants, and their focus at first was on the customers of Klang Valley which includes Bangsar, Mont Kiara, Bukit Bintang and Cyberjaya. But now, they have more than 60 restaurants available with different variety in terms of local, asian, western food and more. Perfect tools to get complete food order delivery.. LIKE it..